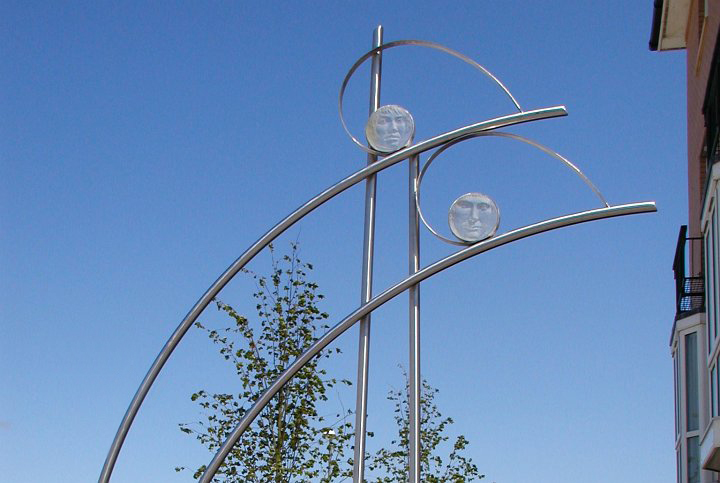 Materials -	bronze, cast glass and stainless steel, height 5.5m. There are five structures, which punctuate the spaces between the new housing blocks and provide identity markers for each building. The sculptures are fabricated in stainless steel, some with elements in bronze and others in cast glass. They evoke the maritime nature of the site: shells, sails, masts even the curve of a wave. An additional light-hearted note is made by the bronze moon face, fish and gulls. ABR were the fabricators of the 316 grade stainless steel structures, Castle Fine Arts Foundry cast the bronzes, and the glass was cast by Jackson Fawkes.